I've got problems with the delivery from Hubzilla.eu and need some ideas. The problem occur already with V3.8.8 (even when I made the already the update to V3.8.9). Right now I've got a message queue of more than 3250. I started yesterday with the troubleshooting cause some user want's to connect to the german "neu hier" forums without success. So I enabled logging with "full" and tried to connect a channel maja@hubzilla.eu to the "neu hier" forums. After that attempt (2min) I disabled the logging again, cause logfile contains more than 80.000 lines. Found some errors regarding diaspora protocol but not sure if that's the reason, cause connecting to a forum should be a ZOT issue. 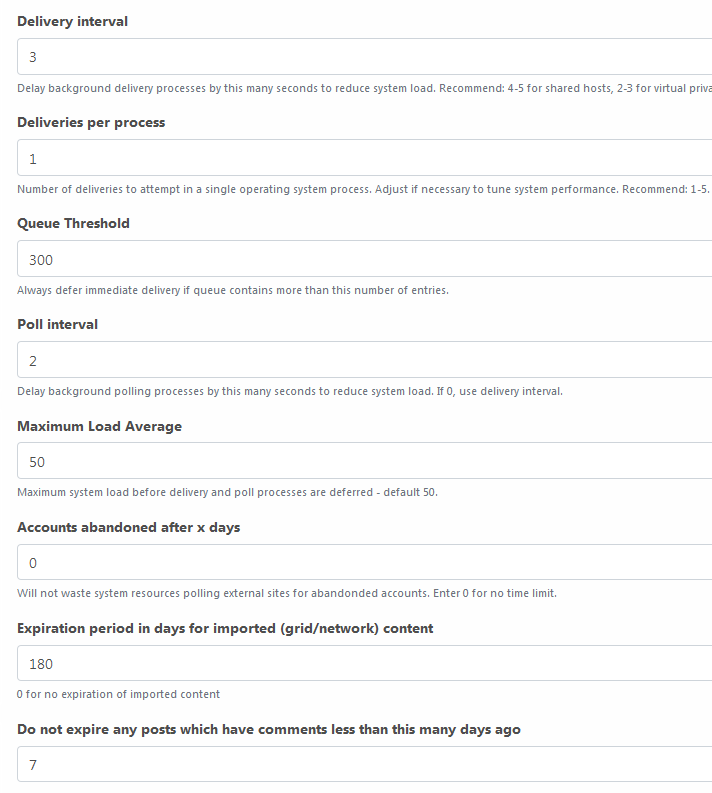 What are your delivery settings and queue threshold? Assuming you are not on a shared host, i would suggest to raise deliveries per process to 3 and queue threshold to about 5000.
ok, thanks. It's a vserver. Will do so. Another thing to check: What is your catalog server? I had a similar queue buildup a while ago because the catalog server I used (which was the default when I installed the hub) had disappeared. What is the prefered debug level for logging? It did take some time before the queue reduced significantly in my case too. Let it do it's thing for a day or so and check again. I've got in all comments and posts I write a notice "undeliverable to some recipient channels." Would it be an Idea to improve the delivery report for future usage to list the human readable handles and not the hashes? Have to build this evening a requery to identify the contacts/channel.